An ascending channel is an uptrend that moves between very accurate limits. It can be confined in two parallel lines from which the one is a trendline support and the other acts like a resistance. The logic is that someone should enter short when price reaches resistance and long when price reaches support, but the odds are better if someone enters only in high probability trades, meaning getting long when price is on support and in the context of an up trending market. Of course first of all we have to spot the channel before entering a position by joining at least two points to form the support (lower line) and two points to form the resistance (upper line). Then the stop loss should be above the upper line when short selling and the profit target should be the lower line. When long, the stop loss should be below the lower line and the profit target should be the upper line. Below is an ascending channel example. We join points 1, 3 and 2, 4 to spot the channel and then we can enter short in point 5 and long in point 6. It is strongly recommended that the entries should be in accordance with market short term trend. A descending channel is a downtrend that moves between very accurate limits. It can be confined in two parallel lines from which the one is a trendline resistance and the other acts like a support. The logic is that someone should enter short when price reaches resistance and long when price reaches support, but the odds are better if someone enters only in high probability trades, meaning getting short when price is on resistance and in the context of a down trending market. Of course first of all we have to spot the channel before entering a position by joining at least two points to form the support (lower line) and two points to form the resistance (upper line). Then the stop loss should be above the upper line when short selling and the profit target should be the lower line. When long, the stop loss should be below the lower line and the profit target should be the upper line. 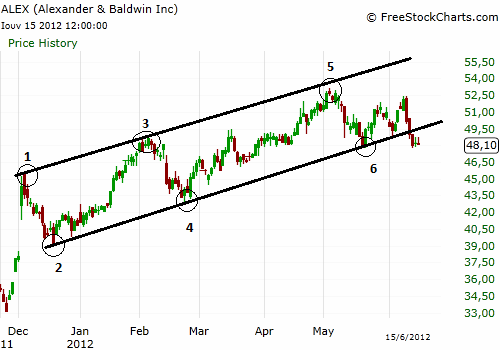 Below is a descending channel example. We join points 1, 3 and 2, 4 to spot the channel and then we can enter short in points 5, 7 and long in point 6. 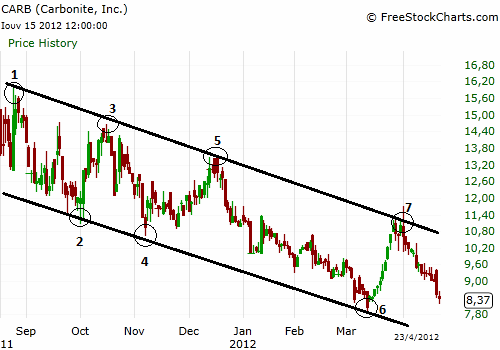 It is strongly recommended that the entries should be in accordance with market short term trend.